Pink and grey are a classic combination, and the perfect way to continue channelling a little femininity to and from the gym during the colder season. For the Be An Athlete 'look of the week' we've gathered a selection of our favourite fitness inspired fashion pieces to compliment your activewear wardrobe this winter. Part of our new Pastel Collection, this 'Aurora Pink and Arctic Grey' Vest is designed to complement your natural shape with its colour block panelling and couture 'luxury athletic' fit. Whether you wear to the gym, at the gym, or after the gym, it will provide you with long-lasting comfort and style. Low-tops are the new high-tops, don't you know, as there's no better example behind this fashion shift than these pastel perfect trainers from Hogan. Soft leather combined with breathable mesh panels makes them the ideal mix of fashion and fitness. Whether you wear it as a standalone bracelet, or embark on years of charm collecting, this extremely cute 'baby pink' bracelet from Pandora will add a girly 'charm' to your arm this winter. Uber contemporary, if not blindingly futuristic, the Optyl Aviator Sunglasses from Gucci add an intriguing twist to a classic design. And they come in pink! The Fiona Paxton pink wrap around bracelet is handmade by artisans in India, so you know it's going to good! Inspired by tribal designs. it's a great way to add a touch of the exotic to your outfit. With a supportive wide rib waist that flatters your midriff, and cuffed hem bottoms for a superior couture fit, these ladies grey shorts by yours truly are guaranteed to be your new favourite training partner. The Be An Athlete cropped zip hoody has been designed to offer the ultimate in comfort and style, with an integrated mp3 player compartment, hidden headphone eyelet, and ribbed cuffs and hems. It will help regulate your body temperature after a workout, and keep you cosy during that cold morning run. A great size for all your gym essentials, the Grafea 'candy crush' rucksack is made in England using beautifully soft leather, and features enough compartments to ensure complete organisation...for about a week. 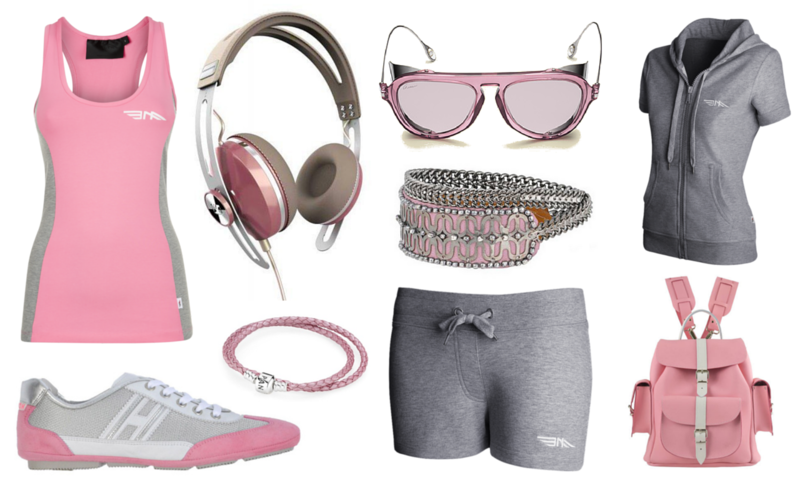 What do you think of our Pink and Grey Look of the Week? Let us know in the comment box below, especially if you can think of any great additions to the outfit, and why not check out our previous fashion edit, where we put together the ultimate 'blue and grey' fitness-inspired apparel for men this season.